THE VIOLIN AND EARLY VIOLINISTS. The Ancestry of the Violin.—The Origin of the Cremona School of Violin-Making.—The Amatis and Stradiuarii.—Extraordinary Art Activity of Italy at this Period.—Antonius Stradiuarius and Joseph Guarnerius.—Something about the Lives of the Two Greatest Violin-Makers of the World.—Corelli, the First Great Violinist.—His Contemporaries and Associates.—Anecdotes of his Career.—Corelli's Pupil, Geminiani.—Philidor, the Composer, Violinist, and Chess-Player.—Giuseppe Tartini.—Becomes an Outcast from his Family on Account of his Love of Music.—Anecdote of the Violinist Veracini.—Tartini's Scientific Discoveries in Music.—His Account of the Origin of the "Devil's Trill. "—Tartini's Pupils. 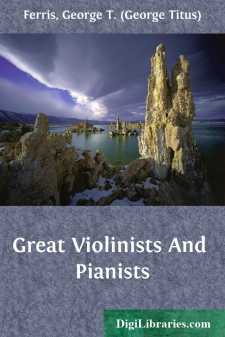 The ancestry of the violin, considering this as the type of stringed instruments played with a bow, goes back to the earliest antiquity; and innumerable passages might be quoted from the Oriental and classical writers illustrating the important part taken by the forefathers of the modern violin in feast, festival, and religious ceremonial, in the fiery delights of battle, and the more dulcet enjoyments of peace. But it was not till the fifteenth century, in Italy, that the art of making instruments of the viol class began to reach toward that high perfection which it speedily attained. The long list of honored names connected with the development of art in the fifteenth, sixteenth, and seventeenth centuries is a mighty roll-call, and among these the names of the great violin-makers, beginning with Gaspard de Salo, of Brescia, who first raised a rude craft to an art, are worthy of being included. From Brescia came the masters who established the Cremona school, a name not only immortal in the history of music, but full of vital significance; for it was not till the violin was perfected, and a distinct school of violin-playing founded, that the creation of the symphony, the highest form of music, became possible.